I recall, during my childhood days, my parents loved making frequent lunch trips from Ang Mo Kio to Selegie House where a famous Indian curry stall used to be. I was not a fan of curry then so I always got to pack along a hot dog while I watched my folks indulge in their curry chicken and finger-licking good crabs. But of course, this arrangement didn't last long. Now, I love my curries and can't live without them! 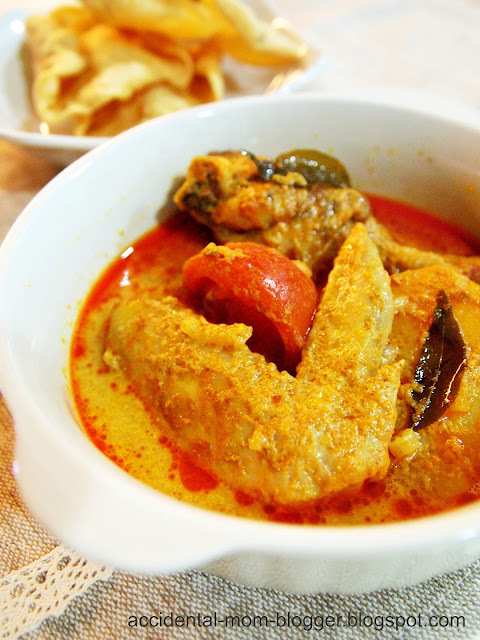 Years later, after I got married, I began to wonder what made curries so delicious and extremely appetizing. There were many things I was going to learn from my mom, since I had already moved out. I wanted to cook for my husband. (I had zero knowledge of cooking at the age of 26) So she told me the key ingredient that made everything so flavorful was coconut milk. Don't be mistaken. I'm not against coconut milk at all. It was just the thought of consuming too much of it, especially when I love savoring the gravy, convinced me that it will not be too good for my weight in the long run! No. Am not a health freak. I love good food! But I try to make informed choices whenever possible. Then, a few weeks ago, Greenfields milk came a'knocking and sent some of their milk products for the family to try. My first thoughts were - "aren't most fresh milk just about the same?" To which I found out that they are indeed different, living up to their label of 'honest milk' - with no additives, chemicals, hormones or antibiotics - now that is really something commendable! Available flavors for everyone in the family! Greenfields milk comes in 2 litre bottles, 1 litre packs, 500ml and 200ml packs which you can find at the chilled section at major supermarkets. The kids love the chocolate malt the most, by the way! 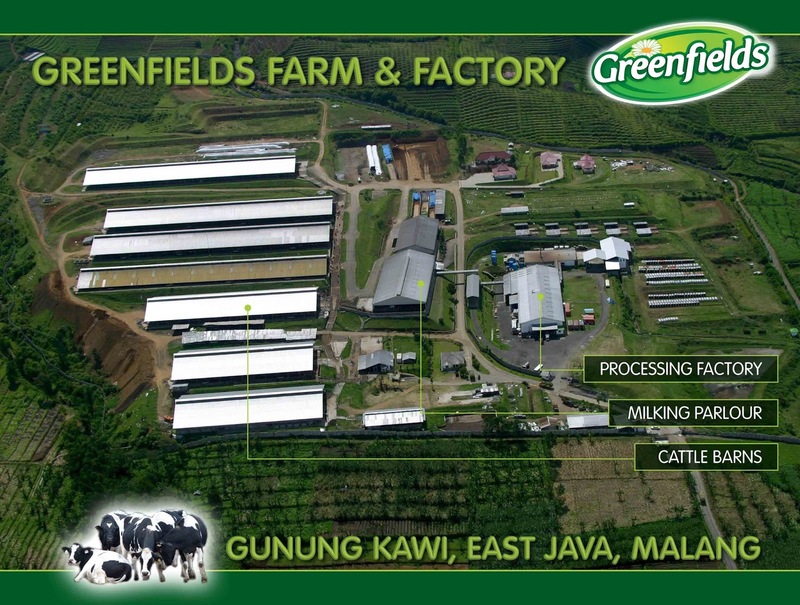 Greenfields is an integrated farm based in Malang, East Java and has over 6,000 Holstein happy cows which produces over 20 million litres of fresh milk every year. Because the farm is so much nearer to where we are, the milk products are delivered to us in quicker time. This ensures the optimal freshness of the milk we consume. Furthermore, with their single-pasteurised milk, produced and packed within the dairy farm, the milk remains fresh and safe for the whole family. Here's my easy chicken curry recipe you can make with Greenfields milk! The result : honest-to-goodness delicious flavors that we all can safely enjoy. - marinade the chicken with the curry powder and set aside. - fry the onions and curry leaves till fragrant. Add chicken and continue to fry. - When it's partially cooked, add the milk, water, potatoes and tomatoes. - Let it simmer for 45 - 60 mins. Serve this aromatic dish with freshly toasted baguette or plain white rice, with papadums on the side for a satisfying meal! Greenfields milk is available at leading supermarkets and 7-11 convenient stores. Fresh Milk, High Calcium Low Fat, High Calcium Skimmed milk and Chocolate Malt comes in 1 litre packs (S$3.25). Fresh milk 200ml packs and Chocolate Malt 200ml packs -only in selected Cold Storage ($1.20) and 7-11 convenient stores (S$1.50). Fresh Milk, High Calcium Low Fat also comes in 2 litres bottle (S$5.95). 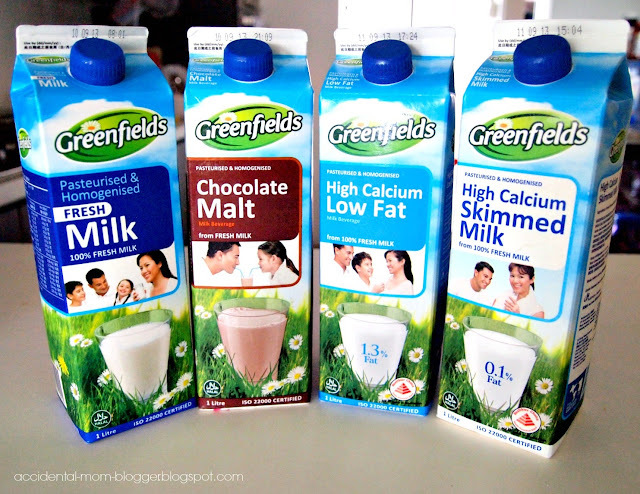 Disclaimer : The Accidental Mom Blogger received milk products from Greenfields for review purpose only. I am in no way, affiliated to this company and opinion about this product is purely my own. Yumz! I am so going to try this! My aunt taught me to use milk instead of coconut milk too when she came to Sweden, she advocates healthy lifestyle! =) Thanks for sharing and motivating me to make some curry for the hubs!